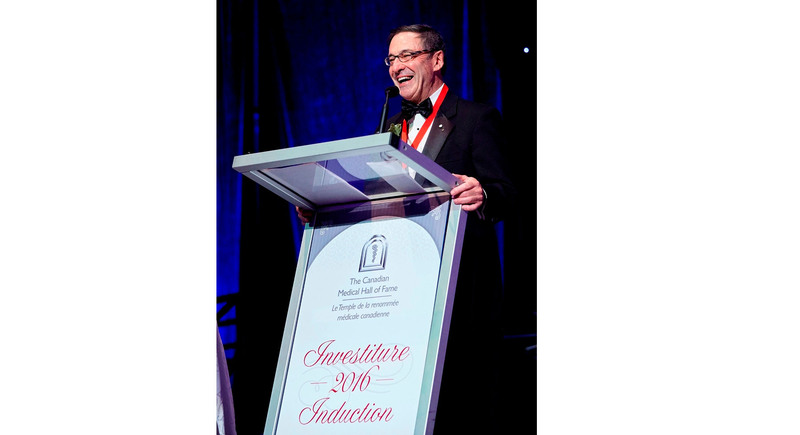 Dr. Mark Wainberg is inducted into the Canadian Medical Hall of Fame. Dr. Mark Wainberg, Director of the HIV/AIDS research section in the Lady Davis Institute at the JGH, has been inducted into the Canadian Medical Hall of Fame in recognition for his pioneering work and social activism. Dr. Wainberg was one of six inductees at an April 14 ceremony, held in association with McMaster University at the Hamilton Convention Centre. Established in 1994 and located in London, Ontario, the Canadian Medical Hall of Fame is a national charitable organization that recognizes and celebrates Canadian heroes whose work has advanced health, thereby inspiring the pursuit of careers in the health sciences. Dr. Wainberg is renowned for his involvement in 1989 in the initial identification of 3TC, an antiviral drug that is now among the most widely used drugs in treating HIV. While President of the International AIDS Society in 2000, he brought the XIIIth International Conference on AIDS to Durban, South Africa, and drew unprecedented attention to the lack of access to anti-HIV drugs in developing countries. Dr. Mark Wainberg (rear, second from left) at the dedication of a Torah scroll that he donated to a Jerusalem synagogue in January in memory of a stabbing victim. In January, Dr. Wainberg also visited Jerusalem for the dedication of a Torah scroll that he donated in memory of 16-year-old Shira Banki, who was stabbed to death in July 2015 during the city’s annual Gay Pride Parade. The 150-year-old Torah scroll, which was originally written by hand on parchment in Baghdad and contains the first five books of the Old Testament, had been carefully restored and was presented to Jerusalem Mayor Nir Barkat for use in one of the city’s Ethiopian synagogues. Dr. Wainberg said he was moved to make the donation after hearing about the death of Ms. Banki, a high school student who attending the parade to show solidarity with her LGBT friends. Dr. Ernesto L. Schiffrin, Physician-in-Chief at the JGH, has been named recipient of the 2015 Distinguished Scientist Lecture and Award by the Canadian Society for Clinical Investigation. Dr. Schiffin, who is Professor and Vice-Director of Research in McGill University’s Department of Medicine, received the award and delivered the lecture in November 2015 at the Society’s annual congress in Toronto. In January, Dr. Schiffrin also became Editor-in-Chief of the American Journal of Hypertension. Dr. Schiffrin is the Tier 1 Canada Research Chair in Vascular and Hypertension Research in the Lady Davis Institute at the JGH. He is a Fellow of the Royal Society of Canada, a Member of the Order of Canada, former President of the International Society of Hypertension (2012-2014) and President of Hypertension Canada (2013-2016). Dr. Beth-Ann Cummings, JGH Director of Undergraduate Education and a staff physician in the Division of Internal Medicine, has been appointed Associate Dean of Undergraduate Medical Education in McGill University’s Faculty of Medicine. 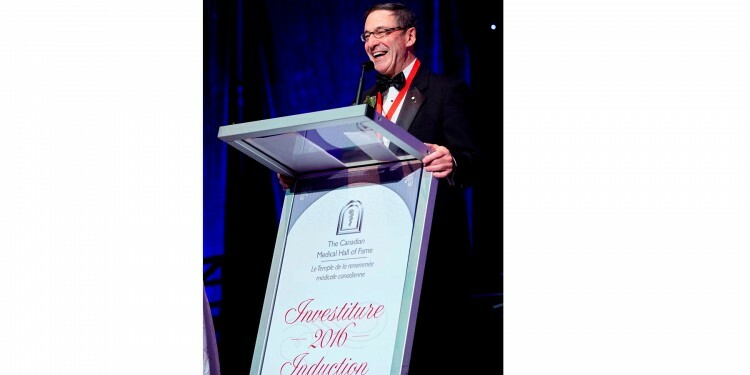 Dr. Cummings, who joined the JGH in 2009, has previously received an Award of Merit from the Canadian Association for Medical Education. Dr. Mel Schwartz, JGH Chief of Dentistry, has been appointed Vice-President of the Board of Directors of the Canadian Association of Hospital Dentists. The organization provides Canada’s hospital-based dentists a forum to enhance clinical practice, teaching, research, administration and dental leadership. Dr. François Béïque, JGH Director of Cardiac Anesthesia has been appointed Chair of the Writing Committee for the certification exam in perioperative transesophageal echocardiography. The appointment covers Canada and the United States, and was made by National Board of Echocardiography, on whose Board of Directors Dr. Béïque sits. Among the members of the JGH perfusion team are (from left) Myriam Burns, Catherine Derome, Julie Gagnon (Chef Perfusionist) and André Bouchard. The JGH perfusion team has won the 2015 Perfusion Week Award, presented by the Canadian Society of Clinical Perfusion. The award is given to one Canadian team per year to acknowledge exellence in the field. Marc Renaud receives the Medal of the National Assembly from Montarville MNA Nathalie Roy (right), in the company of his wife, Diane Brousseau. Marc Renaud, an Ophthalmic Technician in the JGH Department of Ophthalmology, has received the Medal of the National Assembly for increasing global awareness about the dangers of glaucoma. Mr. Renaud, who is also Project Manager for the McGill Glaucoma Information Centre at the JGH, received the award last October in a presentation by Nathalie Roy, MNA for Montarville. 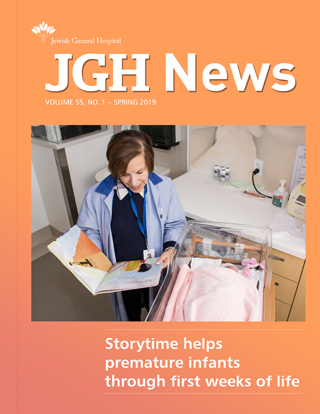 New editions were published last fall of books by Dr. Jacques Corcos, a staff physician and former Chief of the JGH Department of Urology. The books—Textbook of the Neurogenic Bladder (CRC Press) and Overactive Bladder: Practical Management (John Wiley & Sons)—deal with Dr. Corcos’ sub-specialty of voiding dysfunction and are his seventh and eighth published books.